Sure, I like chocolate cake as much as the next guy. In all honesty, I’m certainly not addicted to chocolate or super-sweet stuff. There are plenty of treats I like that are mild and not so decadent. But when I want something, I want it right: Brownies have to be chocolatey. For years, I tried to make vegan brownies that look and taste just like I remember them from childhood. A few times I pulled off a good batch and distributed them among German friends, anxious for them to experience the real thing. But I must confess, I’ve never been a disciplined baker, and I’m kind of afraid of ovens. I wanted a good brownie recipe for the cookbook and website. Something unique for everyone, a sort of American-German collaboration. But something that could still be called a brownie! So, I turned to Jasmin at Baking the Law, and humbly asked for advice. She has far more experience with the baking arts, and I totally dig her style and character. Sure, I could’ve found something to start with in a cookbook, or online. But I wanted to come up with something special. My original idea was double or even triple chocolate brownies. That seemed too commonplace. Jasmin suggested roasted walnuts as a nutty twist. I immediately liked the idea; Many traditional German baking wonders involve ground hazelnuts, almonds, and walnuts. She came up with the starting recipe, so I wouldn’t have to play 3 or 4 batches of Brownie Recipe Roulette. Did I mention I have trouble following baking instructions and mistrust ovens? Cooking is art, Baking is science. The brownies turned out fantastic and delicious. Better even than my most successful experiments over the years! But I can’t claim full credit on this one. I know that it’s cool to ask for help when you need it. If my secret plan works out, getting this recipe out in Germany will help put the chocolate back in “Brownies”… and give Brownie-lovers worldwide a taste of something a bit new and different. Lightly roast walnuts on a tray in oven, or toast in small pan on stove, 3-5 min. Watch carefully, do not burn! Grind roasted walnuts until fine in a food processor, or with mortar and pestle. Combine flour, cocoa, cinnamon, baking powder, baking soda, salt in large bowl. In a separate bowl, mix oil and sugar. Add tofu, vanilla, soy milk, ground walnuts. Mix until smooth. Gradually add flour mix to wet ingredients, continually stirring, followed by chocolate chips. Lightly grease baking form or pan. Pour and spoon batter into pan and spread evenly. Bake for 25-35 min, until a toothpick comes out mostly clean. Allow to cool at least 30 min before cutting. Garnish with powdered sugar or melted chocolate and serve! No Tofu: Substitute 2-3 Tbsn soy flour (or cornstarch) + 1/4 cup water. Nuts: Try crumbled walnuts instead of ground. Use slightly less soy milk and oil, especially if omitting. Orange: Get seasonal with 1 Tbsn orange zest! 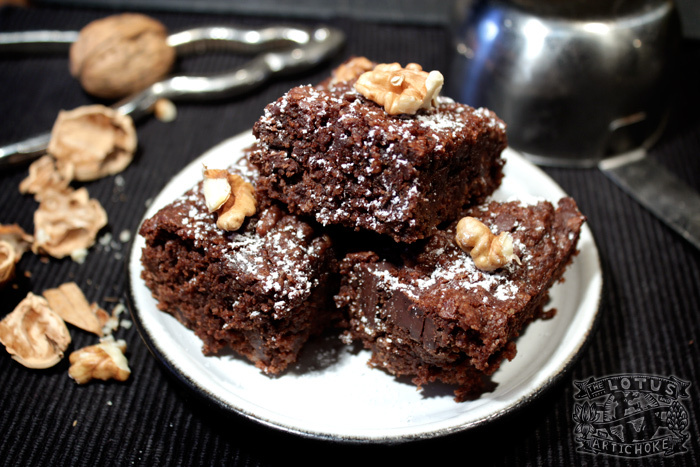 This entry was posted in American, American Comfort, German, Sweets and tagged brownies, chocolate, recipe, vegan, walnuts. Bookmark the permalink. These look just as a perfect brwnie: I agree! It musn’t be cakelike! Thanks, Sophie. They’re excellent, indeed. We just made them again the other night at a friend’s house… and all were impressed. What type of silken tofu do you use? Lisa, I’m using some Japanese organic stuff from the store here in Berlin, Germany. I think any decent brand should be fine. I made them 2 already & loved every bite of them so did Peter! Sophie, you made the brownies twice already? Very cool! I’m so happy to hear both you and Peter are enjoying the recipes so much! Hi Bekki! You’re most welcome. Brownies at 1 a.m. sounds like an excellent idea. ;-) I wish I had some now. Thanks, Alicia! I love these Brownies… and I’m super happy they’re always a hit with others. I make them all the time. I think it’s one of the most popular dessert recipes in my book. Happy Chinese New Year! Thanks for this delightful recipe! The taste of the brownies is perfect- I´m only a bit disappointed about the consistence. Unfortunately my attempt was not as moist and rich as other brownies I did before … :-( Well, they`re more than a chocolate cake. But any way- VERY delicious! Ok- I have to revise :) You didn`t say that these brownies are transformers!? After a while in the fridge they became real brownies- wohoo :-) Waiting can definitely be worthwhile! Hi Caro, glad you were able to improve the brownies in the fridge! I’m not a baking master and I actually got some expert advice for this recipe. From the sounds of it your brownies might have baked slightly too long and got drier and then got moister again from hanging out in the fridge. (For years I always tended to overbake things and dry them out, so I do have some experience with that :-). Also, ovens temperatures are almost never accurate or consistent, and it’s very likely *both* my oven and your oven bake at different temps than they say, and have totally different hot spots. In other words, baking times and temps are really hard to specify universally in a recipe. Congrats on the tasty transformer brownies, and the reminder that the fridge can help! Hi Bettina, I usually use Canola (Räps) oil or Sunflower oil but Peanut should be good, too. I would not suggest butter. Let me know how it goes! Thx. And: sorry about the butter-I´m vegetarian, not vegan yet (but almost, butter is the only exception).